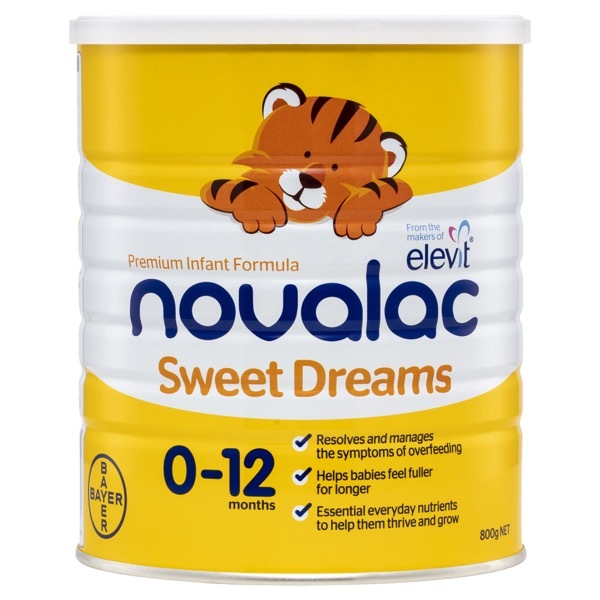 Novalac Sweet Dreams is a premium infant formula that has been specially formulated to give babies a longer-lasting feeling of fullness, helping them sleep peacefully without waking due to hunger for formula fed babies. Novalac Sweet Dreams is a premium infant formula that has been specially formulated to give babies a longer-lasting feeling of fullness, helping them sleep peacefully without waking due to hunger. Novalac Sweet Dreams contains slowly digested ingredients like complex carbohydrates and long-chain fatty acids, so the stomach empties more slowly and your baby feels full for longer. It contains the same energy levels as standard infant formula, so your baby will stay satisfied without being overfed. Novalac Sweet Dreams is nutritionally complete and suitable for ongoing everyday use. Skimmed cow's milk, vegetable oils (soy and palm), maltodextrins, starch, lactose, dextrose, vitamins ( A, D3, E, K1, B1, B2, B6, B12, C, Niacin, Biotin, Folic acid, Pantothenic acid ), emulsifier :soy lecithin, choline bitartrate, tricalcium citrate, disodium phosphate, potassium hydroxide, sodium chloride, potassium chloride, taurine, iron sulphate, magnesium oxide, anti-oxidant : tocopherols, zinc sulphate, L-Carnitine, potassium iodide, copper sulphate, sodium selenite, manganese sulphate. Inositol is naturally occurring.